I got into the spirit of “Rocktober” with two great Jazz Nights Out last week accompanied by fellow JazzColumbus writer Rick Sanford. Up first was Descendre at Carabar on Thursday, October 1st. Guitarist Stan Smith has presented weekly “tribute nights” at the Olde Towne East bar for about a year now, so I’m glad that I finally got a chance to check out one of his shows. The venerable outfit of exploratory improvisation delved into many strains of 1970s era fusion, and the lively and supportive crowd was very responsive to the material. “Lean,” a brand new tune by Stan Smith, was a warm and contemplative ballad, with some sweet Rhodes melodies from Adam Smith. “Runnin,” the conclusion to the first set, featured drummer Justin Campbell and percussionist Danny Aguiar, who led a collaborative jam before Campbell took a hot solo, followed by searing grooves from both Smiths. The band tackled a variety of material with expert musicianship, including the oft-propulsive bass of Jim Tussing. The Brazilian fusion project Nova Madrugada is next up in the series, on Thursday, October 8th, and stay tuned for future installments. On Saturday, October 3rd, Rick and I enjoyed the opening performance of the fantastic fall jazz season at the Wexner Center: Linda Oh’s Sun Pictures band. NYC-based bassist Oh brought along a top-flight band of saxophonist Ben Wendel, guitarist Matt Stevens, and drummer Adam Cruz. The setlist featured selections from Oh’s 2013 album Sun Pictures along with newer material, and the program highlighted her concise compositions and the players’ well-honed improvising chops. First tune “Yoda” opened with an elegant unaccompanied bass solo, personally bringing to mind a classical take on Charles Mingus, before expanding into a soulful ensemble groove that supported excellent solos from Wendel and Stevens. The guitarist and saxophonist played interweaving melodies on the next selection, “Yoda,” and the band ascended into an explosive jam. Oh described the concept of “Speech Impediment” as a story about a man who perseveres over a speech impediment, and the stuttering material painted an evocative picture of the subject. This nuanced and well-paced set sounded great in the Performance Space, and set the tone for upcoming concerts featuring more stars of modern jazz. Thursday, October 8th (8 – 10:30pm): PLECTRASPECT at It Looks Like It’s Open (13 E. Tulane, Clintonville). Hot on the heels of last week’s ninth chapter, this tenth concert of promoter Gerard Cox’s Outward-Sound series, dedicated to the best in outside jazz and improvised music, will focus on state of the art guitar playing. The evening is headlined by experimental Toronto guitarist Ken Aldcroft, and will also include sets by local guitarist L.A. Jenkins and the Stan Smith/Steve Perakis Duo. Admission is on a sliding scale from $5 to $10. Saturday, October 10th (10pm – midnight): Matt Parker Trio at Natalie’s. A press release opening salvo of “Brooklyn saxophonist Matt Parker connects the stylistic dots between Lester Young and Rahsaan Roland Kirk” is quite attention-getting, especially here in Kirk’s hometown, and the trio’s 2014 debut Worlds Put Together does that claim some justice. The world-traveling Parker, a veteran of Maynard Ferguson’s band among a career filled with solid gigs, incorporates classic bop styles into his playing, but is not afraid of venturing into chaotic free jazz territory. With Steve Whipple on bass and Cory Cox on drums, Parker will lead the audience on a robust tour of saxophone sounds. Tickets available here. Sunday, October 11th (2 – 4pm): Chicago Afro Latin Jazz Ensemble at Via Vecchia Winery (Brewery District). The wonderfully booked 2015-16 City Music Columbus season kicks off Sunday with a concert presenting a shining star of the modern Latin jazz scene in celebration of Hispanic Heritage Month. 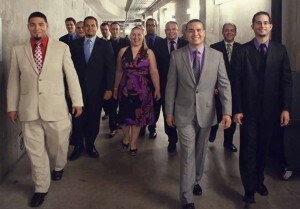 CALJE melds Afro-Cuban and other Latin styles, “incorporating traditional Cuban rhythms such as son, guaguanco, and clave negra with modern jazz harmony.” Co-leaders trumpeter Victor Garcia and pianist Darwin Noguera lead the ensemble, which can expand to as many as 15 pieces, in their intense and passionate dance-ready performances. Tickets for this rare show are available here.